The main form of elbow pain often associated with poor office ergonomics, is lateral epicondylalgia, also known as tennis elbow. Lateral epicondylalgia is certainly a mouthful to pronounce. Fortunately it also goes by another name which is far more commonly known, and that is tennis elbow. For ease of writing and reading, I will refer to lateral epicondylalgia as tennis elbow from now on. Tennis elbow refers to pain around the lateral, or outside, of the elbow, where the forearm muscles attach to the elbow joint. It is generally caused by an overuse of the forearm muscles, which causes irritation to their attachment point, and degeneration of the forearm muscle tendon. When caused by poor office ergonomics, it is usually seen on the side of the body that controls the mouse. In this sense, it is often caused by excessive clicking of the mouse. Think of it like an RSI (repeated stress injury). However, not everyone who clicks a mouse develops tennis elbow. There are often other musculoskeletal issues that increase your chances of developing the tennis elbow. For instance, tightness through the neck and irritation of the nerves that leave the neck and travel down the arm, are very often associated with tennis elbow. This means that short of not using a mouse at all, which is not practical for any office worker (or for me in the writing of this article), there are other things that you can be doing to prevent tennis elbow from occurring, as well as treating it if it has already developed. ​What does this involve? Well, the first thing you need to do is to make sure that your workstation is ergonomically friendly. Have a read of the pages on neck pain and shoulder pain to see the impact that poor office ergonomics has on these regions. As mentioned above, neck tightness and irritation to the cervical nerves often contribute to the development of tennis elbow. As such, you need to address these issues to prevent and treat tennis elbow. And this starts with the overall ergonomics of your workstation, with particular attention being paid to your chair and computer screen height. If you do have tennis elbow, an ergonomic mouse may be indicated. 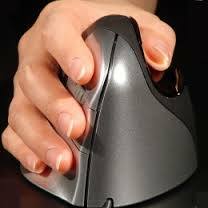 Compared to a regular mouse, an ergonomic mouse changes the position that you keep your forearm in when using the mouse. In a nutshell, an ergonomic mouse places less stress on the outside of the elbow, where tennis elbow develops. However, if you get an ergonomic mouse, and don't address the rest of your workstation ergonomics, particularly the chair and the computer screen height, it is unlikely your symptoms will improve in the long-term. An ergonomic assessment will ensure that any other contributing factors to your tennis elbow are addressed. Your assessor will be able to let you know if you do actually need an ergonomic mouse, potentially saving you money on purchasing an expensive piece of equipment that you don't need. An ergonomic assessment will allow a professional to advise you whether or not you need physiotherapy treatment to help treat your tennis elbow. They can then refer to you an appropriate physio near your location.